The Amish Furniture Feather Bow Back Windsor Bench makes an entryway a lovely place to happen upon. 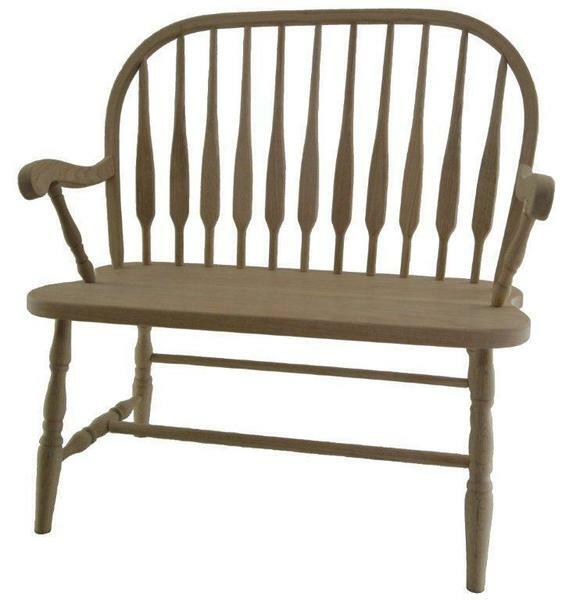 Or, sitting by a bedroom window or in the hallway, this Windsor bench exudes beauty from every angle. Bent feather spindle work lines the back while turned legs and graceful arms frame the cozy seat. You can customize this Windsor bench in the wood and finish you choose to match any area of your home perfectly. Windsor furniture can connect us to another time and immediately invites us to relax. Amish woodworking assures you quality. This Windsor bench will stand strong and elegant with the solid wood outperforming other benches made of lesser materials. Click on select options online or please feel free to call on one of our Amish Furniture Specialists by phone or email. Thank you for shopping DutchCrafters Windsor furniture.